GVWP = teachers teaching teachers. GVWP is a professional network of classroom teachers who understand what teachers need. Our community-funded courses have been custom-tailored to meet those needs: we work hard to offer courses with free or low-cost registration, convenient locations, and parent-friendly program structures that are designed to accommodate teachers' busy schedules. At our summer demonstration labs, the children of participating teachers attend free of charge, allowing parents to address their own needs for professional growth without compromising the needs of their children. We recognize and celebrate the fact that teachers, like students, should be lifelong learners. GVWP programs support the needs of teachers-as-learners. Unlike politicians, who bombard teachers with a massive checklist of things to do, GVWP course leaders narrow the objectives of each course, helping participants focus on key ideas. 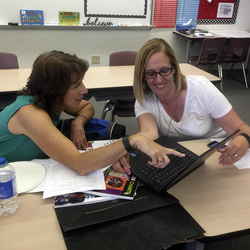 They share practical tools and strategies to help teachers address lofty goals. By providing repeated opportunities for study, observation, and discussion, they help teachers deepen their grasp of literacy standards and find proven pathways that promote student success. Over time, GVWP helps teachers become masters of their craft who share their expertise with others. We support growth by forming long-term professional relationships with teachers. GVWP leaders promote collaboration and build support networks among site colleagues and across school boundaries. 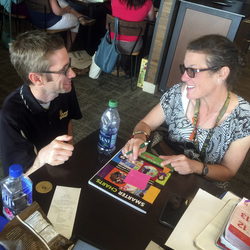 Teachers stay connected through Saturday Seminars and study groups offered during the school year, through a variety of summer programs, and through online discussion groups. A large percentage of participating teachers return to attend more than one GVWP course, and most develop close professional ties with other teachers in their districts. These long-term relationships are an integral part of our “teachers teaching teachers” model. GVWP Community-Funded programs are funded by private contributions. 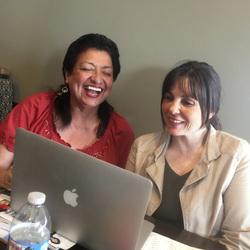 GVWP community-funded programs began in 2004, when Tuff Boy Leasing supplied funding for fourteen teachers who wanted to study better ways to teach writing. Since then, Tuff Boy Leasing has contributed at least $10,000 each year, and the programs have expanded to serve hundreds of students and teachers at numerous campuses each year. In 2016, numerous community groups in Escalon were enlisted to bring similar programs to their community. Click to learn how you can support the cause.